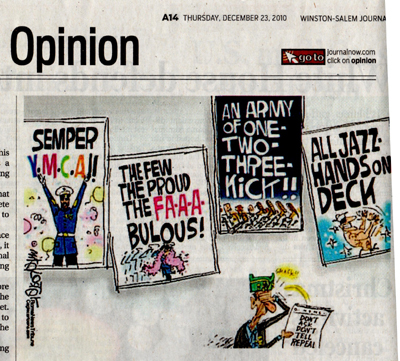 A friend of mine still living in Winston-Salem, N.C., pointed my direction to a handful of ill-conceived, tasteless and offensive political cartoons syndicated by Cagle Cartoons and published by The Winston-Salem Journal following Wednesday’s “Don’t Ask, Don’t Tell” repeal signing. Perhaps the worst of the three political cartoons is Brian Fairrington’s which pictures a flag-draped coffin and a newspaper lying side-by-side. The paper’s headline reads, “Don’t Ask, Don’t Tell Repealed,” while a comment bubble over the coffin says, “You Go Girl!” The cartoon, in one fell swoop, manages to not only make light of the sacrifices of lesbian, gay and bisexual servicemembers but also each and every American who gave the ultimate sacrifice in service to their nation. Though the flag-draped coffin is the worst, the other two are just as tasteless. Again, they make light of the service of lesbian, gay and bisexual servicemembers and the personal and public sacrifices they’ve had to make to serve this nation especially in this time of war. Mike Lester’s cartoon, picturing an older man imagining the worst possible “queering” of the military, serves only to perpetuate the exact prejudices and bigotry that made “Don’t Ask, Don’t Tell” possible and kept it in place for 17 years. 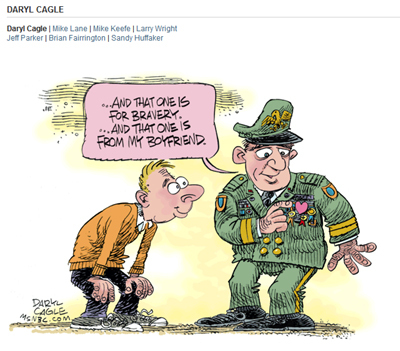 The same is true of Daryl Cagle’s cartoon, picturing not a valiant and respectable gay servicemember but rather a servicemember “flaunting” his sexuality along with his service awards. Gay and lesbian members of the U.S. Armed Forces are disrespected in these cartoons. Their tireless service on behalf of our freedoms and safety, along with that of their heterosexual colleagues, is reduced to serving as punch lines of insensitive jokes. The cartoons are below. Two were published on the Journal’s site and one published in the paper on Dec. 23, 2010. 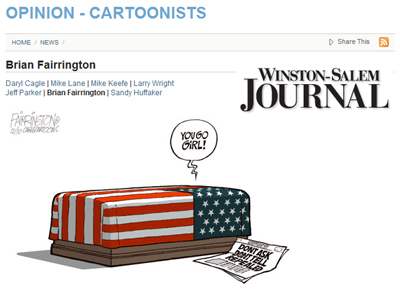 Links to each cartoon on Cagle’s site are provided below.